This museum is on the site where Henry Wells and William Fargo first opened for business in the booming gold rush days of 1852. It is dedicated to preserving the history of the company. Because Wells Fargo Bank was so integral to the development of California, the museum is a real treasure to anyone interested in the early days of San Francisco and California. As one would expect of a major corporation, such as Wells Fargo, the exhibits are well thought out and professionally displayed. In the museum you will find samples of gold nuggets from all the major Mother Lode rivers in foothills of the Sierra Nevada Mountains, an actual Wells Fargo stagecoach and mid 19th century banking equipment. The museum does an excellent job of telling the story of Black Bart, who successfully robbed Wells Fargo stagecoaches 27 times. (He should have stopped there because the 28th time did not go so well.) 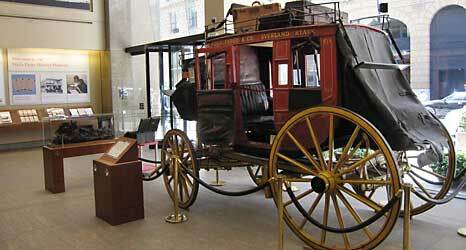 One of the more interesting exhibits for those of us who are frequent travelers, is a mock-up of a stagecoach that one is invited to sit in while listening to an actor read from a diary of a man's trip in such a coach in 1859 from St. Louis to San Francisco. Sitting in the confines of a coach with a few others and imagining it filled with nine people helps put our whines about modern travel in perspective. There are, of course, many other noteworthy items, including fine portraits of the two great men who put it all in motion and John Rush's excellent original painting of the Wells Fargo stagecoach, which has been reproduced millions of times in Wells Fargo's promotional materials.